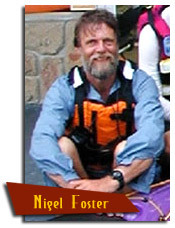 Nigel Foster is an international figure in Sea Kayaking, known for his writing, instruction, his symposium appearances and his kayak designs, (he has to date designed six sea kayaks, three of which, the Legend, Silhouette and Shadow, are manufactured and distributed by Seaward Kayaks.) He writes for Sea Kayaker Magazine and has written five books on paddling topics. These are his popular “Nigel Foster’s Sea Kayaking” and “Nigel Foster’s Surf Kayaking”, his latest book “A Sea Kayaking Guide to Southern Florida”, (all three published in USA by Globe Pequot Press) and “Kayaking, a Beginner’s Guide”, and “Open Canoe Technique” (both published in U.K. by Fernhurst Books. Nigel began paddling at the age of 15 in a canvas kayak, but soon graduated to the “slalom” kayak in which he developed an obsession for surf kayaking. One of his first journeys in a sea kayak was across the English Channel to France, which he then repeated at night. His 400-mile solo journey around the southwest peninsula of England and along the English Channel coast led him into his longer explorations in Scotland. In 1977 at the age of 24 he became the first to circumnavigate Iceland by kayak with companion Geoff Hunter. For this trip they paddled a pair of Foster’s first design of sea kayaks, the “Vyneck”. By this time he was professionally involved in teaching kayaking, and in the following years began leading groups in places like Norway and the Faroe Islands. This didn’t prevent him from escaping to explore the Atlantic coast of Newfoundland, and to cross France from North to South in a double racing kayak following canals and rivers. Nigel taught at the National Watersports Centre in Wales UK before starting his own kayaking business running training courses in Wales, and guiding trips further afield in England and Scotland, and to places such as Iceland, the Faroe Islands and Arctic Norway. Well known for his travels and his distinctive teaching style, Nigel Foster became a popular international figure, teaching and making presentations in Sweden, the Netherlands, Finland, Denmark, and across the Atlantic in Canada and USA. Increasing demands on his time for presentations and teaching in USA prompted him to finally move to USA where he currently lives in Seattle WA. A partner in Sweetwater Kayaks in Florida, Nigel continues to travel both to teach and to explore new paddling areas. 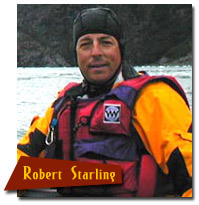 Robert Starling, Founder and President of Starling Productions, Inc. is widely regarding in the creative imaging profession as the leader in video production, still photography and display solutions for sales and marketing professionals. Since founding the company in 1979, Starling has been recognized industry wide as an innovator in both traditional and digital technology based imaging solutions. In 1999, 2000, 2001 2002,2003. 2004, 2005, and 2006, Starling Productions was ranked among the “Top Five” companies of its class. Starling’s award winning work has been broadcast and featured worldwide in thousands of industry publications and videos representing clients such as Outdoor Life Network, McDonalds, Tailormade Golf, Jaguar, the American Resort Development Association (ARDA), Disney, Marriott, Hyatt, Westin, Hilton and Starwood. He is a highly respected and sought after speaker at imaging conferences around the United States and served as Chairman of the International Digital & Advanced Imaging Technology Committee, as well as the International Advanced Imaging Task Force.